Doug and I have returned from the cycling industry event, Outerbike in Moab Utah this past April 6 - 8th. The FenderBag (FB) was introduced to many bicycle manufacturing companies and the general mountain biking public at the event. 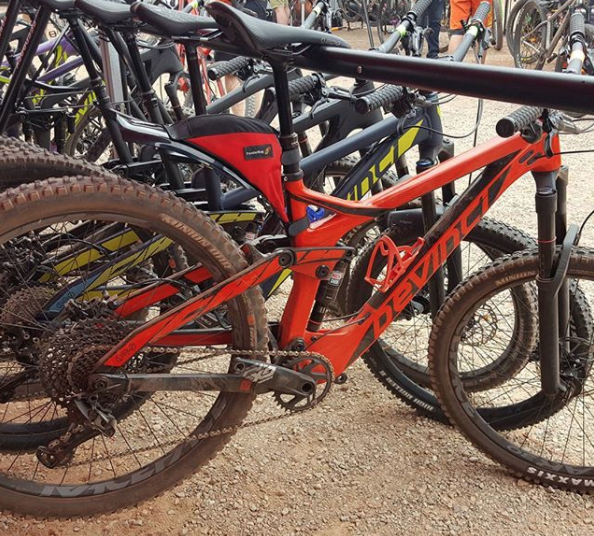 This event featured a variety of full suspension mountain bikes, hardtail mt., bikes, and variety of cycling accessories. Company reps such as Specialized, Devinci, Liv and others got to see first hand the FenderBag on their bikes. We experienced mostly positive praise from bike companies and individual cycling enthusiasts. However, some bike reps and individuals where skeptical of the FenderBag. Many reps just didn't believe that it would "fit" and not interfere. It took attaching the FB to bikes before reps saw the potential. It didn't fit all bikes, and we have been saying this form the start. The FB fits most bikes so long as the bike meets the seat post/tube space required to accommodate the FB. There is an element of disbelief that will take some convincing to overcome, we now know. backpack. We are not sure if it's the convenience of having the hydration tube dangling on the shoulder of the rider or if it's just the accepted attire of the modern mountain biker these days. A repeated comment was, "nobody likes wearing a backpack"; however, most riders wear one. Former roadie cyclist, Floyd Landis, was at this event representing his company, Floyd's of Leadville. I asked him about wearing a backpack while riding. He responded, "no way". I mentioned that he should look around, and notice all the backpacks being worn by riders. His response to that was, "whatever". I have yet to meet a professional cyclist or x-pro that wears a backpack cycling or would even consider wearing one. One of my take aways was that the mountain bike industry appears to be much more consumer driven these days. It used to be almost entirely racer driven. I am speaking to the acceptance of the cycling hydration pack here. The casual cycling consumer is fine with the discomfort of the backpack, where the professional would never consider it. Another interesting observation I have made is that often the "guy" is wearing the backpack. Somehow the handicap of being a girl when riding with your boyfriend translates into them, the guy, gets to carry all the stuff. Not to say there are plenty of women bikers who wear bike backpacks. Just seems to be a reoccurring scenario that the man wears the pack, not her. Must be women's lib thing. It's my perspective that the consumer market is ready for the FenderBag. Although this market has embraced the cycling backpack, there is room to offer options to the consumer. Having the FenderBag in the consumer market, will help alter this trend and open the door for options such as the FenderBag. Overall attending this event was a success. In addition to introducing the FenderBag to the consumer market, we listened to design recommendations. We have recognized some simple modifications to the current design. This is what we had hoped for. Getting the FB in front of many people and on many bikes in order to identify any design modifications before running an actual production run. This was accomplished. On another note, our Kickstarter campaign is not going well. However, we have relaunched the Kickstarter campaign with a new strategy with a focus on success. Please sign up for our email list, that way we can keep you updated on the FenderBag Kickstarter campaign. We look forward to bringing the FenderBag to the market place.